Our designed and patented MPS™ allows Zap-Lok™ and other mechanical connected pipe to be laid from a standard DP 2 vessel. The MPS comprises all the equipment necessary to perform pipelay on standard pipe sizes of 2” to 16” in an S-lay configuration. Being modular, the MPS™ is adjustable in width and length to cater for available deck space and the amount of product to be laid for a particular project. 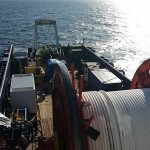 The MPS™ can be adapted from rigid pipelay to flexible pipelay with the addition of a powered reel drive or carousel, or we provide a dedicated installation spread specific to the product requirements. Up to 5km lay rate in 24hrs, with a quick mobilisation. Can be adapted from rigid pipelay to flexible pipelay with the addition of a powered reel drive or carousel. Significant cost savings over traditional pipelay methods. The modular nature of the MPS™ is adjustable in width and length to cater for available deck space and the amount of product to be laid for a particular project. 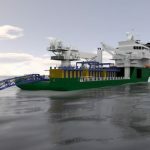 The company brings together subsea services, technology products, project management and engineering capabilities to provide solutions that are innovative and cost effective for the client. View our full project track record online.